As discussed in the introduction to this paper, people often ascribe blame based upon their internal logical calculus or emotional belief as to what a ‘cause’ of an event is. Within the context of firearm violence, this is particularly true. Firearm control advocates state that “firearms cause” violence etc. For this reason, it is important to understand the philosophical underpinnings of reasoning and how they apply to determining ‘cause’. As important is the understanding of errors in logics. Within logic, errors in either reasoning or structure are known as fallacies. With an understanding of the common fallacies that pertain to identification of cause, it is easier to understand and identify the true, or actual cause of an event. Logic, or reasoning, is described as scientia scientiarum or the science of science for the prominent and important role reasoning plays in the sciences[ii]. While formal logic has been studied for at least two millennia, and informal logic for nearly one millennium, it is the theory of fallacies that provides the tools for critical thought. UNLV’s Distinguished Professor of Philosophy; Emeritus Maurice Finnocchiaro stated that fallacies: “may be interpreted as a more relevant contribution to the evaluation of reasoning”[iii]. Kirby and Goodpaster stated in 2007 that: “Thinking logically and identifying reasoning fallacies in one’s own and in other’s thinking is the heart of critical thinking”[iv]. The search for cause requires an understanding of logic as well as the common fallacies that relate to the concept. In his seminal 1893 work Logic; Inductive and Deductive, William Minto stated that logic could be defined as a: “…system of defense against error” with the objective being the “…organization of reason against confusion and falsehood”. While the evolution of Logic extends to Aristotle and his focus on dialectics it was in the 13th Century when Bacon articulated the concept of inductive logic that saw the creation to a separate, though related branch of study. In Sir Francis Bacon’s Opus Majus, he stated, “There are two ways of knowing, by Argument and by Experience. Argument concludes a question, but it does not make us feel certain, unless the truth be also found in experience”. Minto also posited that logic “…shows the inquirer how to test and purge his conclusions, not how to reach them”. [v] Applying logic, therefore, is necessary to understand whether a stated position is valid or not. Deductive, or formal, logic is a type of reasoning in which two or more premises are offered and then a conclusion is derived that, by definition, must follow from the premises. The structure is known as a syllogism and is critical to evaluating the validity of the argument. If the premises of a formal argument are valid then the conclusion must, by rule, be valid[vi]. Inductive or informal logic, by contrast, presents premises to support a conclusion but the conclusion is not guaranteed to follow from the premises[vii]. Mr. Bennett stated, “Arguments where the conclusion is merely based on probability, not necessity, are considered inductive arguments”. [viii] The Cambridge Dictionary of Philosophy defines inductive logic as: “… most generally … the theory of the evaluation of ampliative inference”. [ix] In short, in deductive logic, the conclusion of a valid deductive syllogism must be valid, whereas in inductive logic the conclusions are only likely to be valid. Inductive or informal reasoning then is the type of reasoning that people apply on a daily basis. As the validity of an inductive argument is based upon “ampliative inference” both errors in logic as well as errors in the structure of the argument can influence the inference that is taken from the presented evidence. For this reason it is critical to understand the fallacies that affect such forms of reasoning and particularly those that impact the identification of cause. While the construct of logic contains hundreds of fallacies in four major groups, they can be grouped into the two general categories of informal and formal logical fallacies . In simple terms, formal fallacies have an error in structure of the argument. [xvi] Informal fallacies, on the other hand, have correct structure but the content of the argument has errors. [xvii] “…an informal fallacy is a fallacy that isn’t covered by some system of deductive or inductive logic”. Formal and informal fallacies are present in both deductive and inductive forms of logic. Given that formal fallacies result only from the structure of an argument and not the content, they are, as Finocchiaro said “…conceptually indistinguishable from the theory of validity, since, as the textbooks point out, a formal fallacy may be regarded as any (formally) invalid argument…”. [xviii] This is not to suggest that formal fallacies are any less important to the evaluation or reasoning, rather simply to identify that they represent a different criteria of evaluation. With a basic understanding of formal and informal logic, as well as formal and informal fallacies, it becomes easier to understand if and when a presented argument is fallacious. Causality is so critical to logic and daily life that philosophers have studied the concept for millennia and causality has numerous fallacies specific to the argument of causality. Using Meltzof’s definition, it is apparent that an ‘agent’ or ‘agency’ must be the ‘initiator’ of the sequence of the events and be a ‘proximal antecedent’ to the sequence of events that brings about the effect in which we are currently interested: crime. Using this definition in the context of a data breach supports the position that if a person or persons initiated a sequence of events that exploited vulnerabilities which resulted in the compromise of systems or data, the person is therefore the actual cause of the compromise. The agent, in this case the person who initiated the sequence of events, is antecedent in that it preceded the effect (in this case the compromise of data) and it is proximal in that the initiating action is not too far removed from a temporal perspective as to raise doubts about the cause. In short, a direct line of cause and effect can be drawn between the initial action which set the sequence in motion and the effect that resulted. 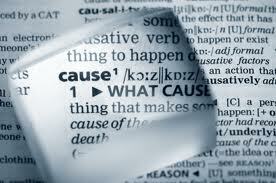 It is important to note the two additional aspects of cause. The sequence of events initiated by the agent must be necessary and sufficient to bring about the effects. Consider a situation in which a person we will call Bill fires a firearm that kills another person. Without using a definition such as that provided by Meltzof, it could be argued that any number of factors, including Bill, were the “cause” of the fatality. One could blame the firearm, the bullet, the firing pin, or even the propellant that fired the projectile. Using the provided definition, it is clear that the proximal antecedent that initiated the chain of events is Bill, who pulled the trigger on the firearm which, in turn initiated the sequence of events (firing pin hits primer, primer ignites propellant, propellant burns creating pressure, pressure accelerates the bullet through the barrel etc)that resulted in the death of the other person. This is an important point to remember, as blame is often placed on the ‘firearm’ for the violent action when in fact, it is the person initiating the sequence of evince that is the actual or primary cause. The firearm is simply a tool the person used to achieve the desired effects. Correlation and causation are so frequently confused or intertwined that it merits discussion in this paper. Cause, as defined by Meltzoff and many other philosophers, requires that an initiating action be a ‘proximal antecedent’ to the effect. It is this temporal and structural relationship (ie. One event precedes another) that provides fertile ground for those seeking to find cause to make fallacious arguments or reach incorrect conclusions. The provided examples are of a spurious relationships. A spurious relationship is a relationship in which two events or variables have no direct causal connection, yet it may be wrongly inferred that they do, due to either coincidence or the presence of a certain third, unseen factor (referred to as a “confounding factor” or “lurking variable”)[xxiii]. If no coincidence is present then it is the third, or ‘confounding variable’ that implies causality. As stated previously, it is the warm weather in the Southwest that creates an environment in which more ice cream is consumed, people are more active, and snakes are more active. This results in a spurious relationship in which ice cream consumption and snakebites are positively correlated yet not causally related. Com hoc, ergo propter hoc is a Latin phrase that describes a common error fallacy within the Questionable Cause (non causa, pro causa) informal logical category. It describes a situation, like that described between snakebites and ice cream, where people believe that correlation implies causation. Without further information or understanding it is possible that the correlation between two events is simply spurious and has no causal relationship. Understanding causation and correlation and what, if any, relationship exists between the two is important for those trying to ascribe blame for a crime. Another fallacy that is often made in the evaluation of cause is that of post hoc, ergo propter hoc. Translated roughly as “after this, therefore because of this” in Latin. It is the mistaken belief that one condition preceding another condition must necessarily cause the succeeding event. [xxiv] Fans of professional baseball can witness post hoc, ergo propter hoc when players are in a batting slump or are hitting well. Superstitious players will often adopt a ritual that they happened to have used before hitting particularly well in the belief that somehow this ritual, by preceding the batting, causes the hitter to bat well. In reality it is nothing more than one event occurring before another event (a proximal antecedent event) and which has no causal effect. The previous examples can be considered spurious correlations or relationships in which two elements are correlated yet have no direct causal relationship. Readers clearly understand that situations cannot arise in a vacuum and that even a victim’s actions can increase the probability of an event occurring. For example, the simple act of walking to work will certainly increase the odds of a that person being hit by a car. The difficulty for many is understanding the difference between a contributing factor and one in which cause or blame for the event can be assigned. Contributing or enabling factors can be defined as “…a state or condition that allows something to happen that is not, by definition, the cause.” Contributing factors provide an easy target for those who wish to ascribe cause to the crime. People may confuse a condition which enables an action to occur as the actual cause of the event. Consider a person carrying a large sum of money who is subsequently robbed of said money. Without the money in their possession the robber could not have stolen the money from the victim. Regardless of the fact that the person was carrying the money, the presence of the money did not cause the robber to commit the crime. The robber that initiated the sequence of events that resulted in the effect (stolen money) caused the actual robbery. Did the presence of a large sum of money create a condition in which the victim was a more attractive target? Possibly. If the victim was walking down a dark alley in a questionable part of town some would argue that this also contributed to the event. The difficulty then is discerning when the victim is responsible for actions that may contribute and how to judge such actions or inactions. In the event of a crime committed with a firearm, the firearm is certainly the tool used to perpetrate the crime but it is not the ‘cause’ of the crime. Put simply, certain conditions enable things to happen that probably would not happen otherwise. This, however, is not the cause of the event. [i] Beebee, Helen; Hitchcock, Christopher; Menzies, Peter (2009-11-12). The Oxford Handbook of Causation (Oxford Handbooks in Philosophy) (p. 1). Oxford University Press. Kindle Edition. [iv] Kirby, G. R., & Goodpaster, J. R. (2007). Thinking: An interdisciplinary approach to critical and creative thought. Upper Saddle River, N.J: Pearson Prentice Hall. [ix] Audi, R. (1995). The Cambridge dictionary of philosophy. Cambridge: Cambridge University Press. [xvi] Pirie, M. (2007). How to win every argument: The use and abuse of logic. London: Continuum. [xix] Beebee, Helen; Hitchcock, Christopher; Menzies, Peter (2009-11-12). The Oxford Handbook of Causation (Oxford Handbooks in Philosophy) (p. 111). Oxford University Press. Kindle Edition. [xxi] Meltzoff, Julian (2010-06-01). Critical Thinking About Research: Psychology and Related Fields (Kindle Locations 659-661). American Psychological Association. Kindle Edition. [xxiv] Meltzoff, Julian (2010-06-01). Critical Thinking About Research: Psychology and Related Fields (Kindle Location 617). American Psychological Association. Kindle Edition. And finally, if guns kill people then spoons made Rosie O’Donnel fat. Understanding Cause is an important concept in understanding security. I say that I do enjoy your writing and blog and no exception here. I felt you presented a good argument with excellent resources and citation. I would really enjoyed if your conclusion had spent more time tying things together to better reinforce the argument. Of course I am reading this on a shuttle ride after spending the day at a stock car race, but I do think your argument/position would be much better served with a more drawn out conclusion. Regardless, I appreciate your time and work. Thanks Dale!…this was a ‘cut and paste’ from a larger research piece. I put it together pretty quickly and your observations are correct and well taken. I appreciate your reading!